So you’ve made the big decision that you want to take up road cycling. You can read about my own personal journey under the My Story tab. I’ll try not to repeat too much of it here. The first and most important thing to remember is that it’s called a ROAD bike, that means you should ride it on the road (or perhaps a bitumen or concrete bike path) but pretty much nowhere else. You can of course ride for short distances on firm gravel surfaces, paved surfaces and even firm grass but never forget the golden rule – it’s not called a ROAD bike for nothing. It has very skinny tyres with very little grip. Just ask any novice rider about their experiences of off-road riding on a road bike and you’ll hear the same sad ‘bruising’ stories. Before we get started, I’m assuming that you can already ride a bike and that you’ve decided you want to ride a road bike not a weekend cruiser. The first step is to assess your own fitness level. If you’re already exercising regularly you’ll have no trouble completing a 30 km ride on your first attempt. If you don’t exercise very often then you might have to take it a bit slower. 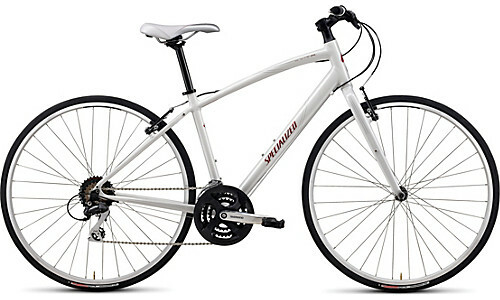 See my previous post for a long explanation of women’s specific road bikes. You could also consider starting on something more affordable like a flat bar road bike (so called because it has flat handle bars rather than drop bars). A few of my bike riding buddies started on these types of bikes but now they’ve all switched to road bikes. If you’re lucky enough to be able to borrow someone else’s bike just to get going and it’s about the right size then go with that. Lots of people say ‘I wouldn’t be seen dead in lycra! !’ and start out wearing loose fitting clothing. The funny thing I’ve found is that nearly everyone moves over to lycra within a short period of time. I spent much of my twenties and thirties wearing loose fitting clothing for exercise but now proudly leave the house wearing tight-fitting lycra. It’s comfortable, functional and if you choose the right items can even be flattering. To start with I didn’t worry too much about colour coordination but now think carefully every time I leave the house. My favourite outfits even match my beloved bike!!!! Clip-in shoes are also part of the road rider’s outfit and if you don’t wear them from day one you’ll move to them at some stage. I wore them from day one and have never looked back. I was terrified of them but soon got the hang of it. It’s also part of the right of passage of all road bike riders that you’ll forget about your clip-in shoes and fall off at least once and usually in front of a few amused friends or car drivers at the traffic lights. We all do it and as long as it is at low speed and you avoid any obstacles on your way down, you should survive with just a few bruises and a bit of embarrassment. You might start out by riding on bike paths if you’re lucky enough to have them in your local area but most ‘serious’ road bike riders will soon graduate to the road which is what I did fairly quickly. I still ride on paths occasionally but I avoid them particularly on weekends where you have to share them with pedestrians and other less confident cyclists like small children! (I’m not against ‘little people’ cyclists but riding near some of them when they are on their cute little bikes can be rather scary). The best motivation you’ll ever get to go bike riding is meeting up with a group of like-minded individuals. Many, many times I’ve woken up in the early morning and wanted to stay in bed but I’ve dragged myself out of bed because I’ve agreed to meet one or more people and I just can’t let them (or myself) down. I was fortunate to find the fabulous BayBUG group just after I bought my bike. BUG stands for ‘Bicycle User Group’ and there are plenty of them. They are listed on the Push On website. You could also try asking at your local bike shop. They often organise their own rides and that’s how I found out about BayBUG. Once you’ve started riding you need to know some basic mechanical stuff so you won’t spend a fortune in the bike shop. The number one thing is to learn how to change a flat tyre. Unfortunately our roads are littered with shards of glass and other debris and you’ll inevitably get a flat. All the men I know will laugh when they read this because they all know I’ve never actually changed my own tyre. Every time I’ve had a flat they’ve all jumped in and done it for me. That’s one of the benefits of riding with a bunch. However, I maintain that I do know how to do it so if I’m ever stranded I will be able to change it (in theory anyway). I hope this helps get you started on my favourite past-time. In future posts I’ll cover other aspects like learning to ride in a bunch of riders and other stuff. I’d love to hear from others about how they got started. Previous Post:Do I really need a women’s specific road bike?